Many schools and districts are examining MOOCs as a method for “flipping” professional development for their teachers. 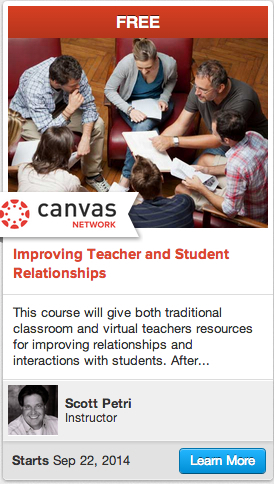 Improving Teacher and Student Relationships is one of more than 30 Canvas Network courses that start this month. Canvas has hosted over 300 MOOCs from 125 organizations. The breadth of these offerings provide districts with methods to meet the intrinsic motivation needs of technology-dependent staff members, differentiate instruction for their non-tech using staff, and allow teachers a greater amount of choice in their professional learning overall. Reichert & Hawley (2014) found that the teacher-student connection does not merely contribute to or enhance teaching and learning; this relationship is the very medium through which successful teaching and learning is carried out. Research indicates that the factors described in successful teacher student relationships can be developed. Teachers who effectively establish positive relationships with their students are characterized by: reaching out, often beyond standard classroom protocols, to locate and meet particular student needs; locating and responding to students’ individual interests and talents; sharing common interests and talents; sharing common characteristics, such as ethnicity, faith, and learning approaches; being willing, when appropriate, to disclose personal experiences; being willing to accommodate a measure of opposition; and being willing to reveal some degree of personal vulnerability. Researchers are still defining what barriers teachers perceive in improving relationships with their students and how online and traditional teachers differ in building teacher student relationships. The goal of this course is to help teachers develop growth mindsets about improving their relationships with students. Playlists of video lectures, readings, and discussion board activities will allow teachers to thinkaloud and practice with relationship-building tools within a caring instructional community. This course will review contemporary research and pedagogical programs that you can implement in your classroom to enhance teaching and learning. Enroll here. Hello Everyone. 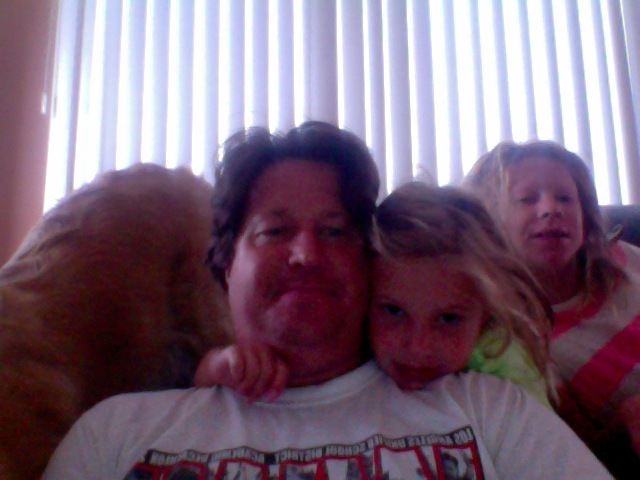 I am, Dr. Scott Petri, your instructor for Improving Teacher and Student Relationships. Welcome to the second lecture on improving teacher and parent communication. Thank you to the great people at Match Education for this great book Phoning Parents by Michael Goldstein. It’s cheaper than a Venti at Starbucks. Go get it. This video will explain the six types of phone calls the book advocates making. If you read the study by Matt Kraft on the website, you know making proactive calls to parents created stronger teacher-student relationships, improved parental involvement, and increased student motivation. The book recommends making this systemic behavior, investing 30 minutes a day in making parent phone calls. These calls should be no longer than 5 minutes each, which means you can make 6 calls per day, 36 calls a week. If you have 180 students, it will take 5 weeks to call every parent. The six reasons for making these phone calls are: Shows courtesy and respect to both student and parent; You know parent got the message because you hear them saying uh-huh and what? Phone call communication is 1 to 1; Provide parents with more detailed information about their child’s progress and behavior than progress reports or dailies; Teacher can provide specific advice to the parent; and Increases student interest and investment in learning. You didn’t finish your work in class today, what was the problem? Services like Remind.com, or Remind 101 can help personalize batch messages. Texting is the most popular form of communicating for teenagers. 87% of high school seniors text every day, whereas only 61% of them use Facebook daily. This may not be the medium of choice for parents, so ask what they prefer. I hope you will consider investing some time in making proactive phone calls to increase your students’ engagement this year. Be sure to check out the additional resources and supplementary videos I’ve put on the blog under the tag phoning parents. For the past few weeks I have been gathering materials and brainstorming assignments for the MOOC I will be co-teaching with Mr. Thomas on Improving Teacher-Student Relationships. I recently completed another MOOC on Coaching Teachers that used a coaching feedback session and required students to debrief the video in a peer reviewed writing assignment. Sort of along those lines, we could use an excerpt Solving Problems Together from pp. 129-149 of How to Talk So Kids Can Learn. As an extension activity, course participants will script problem scenarios, or conflicts they have had with students in their classrooms (and wish they could do over) by grade level and topic on the discussion board. Once published and viewable, these scenarios will provide asynchronous opportunities for participants to practice summarizing the child’s point of view and brainstorming solutions collaboratively. Finally, we would offer participants a chance to participate in role playing sessions in real time via Skype or Google Hangouts (video chat). With the right social media tools (Twitter & Facebook) participants may be able to link up and practice some of these techniques together, even if they are continents apart. For participants who cannot participate in the real time chats, we can provide links to the videos so they can view the sessions. I am open to any feedback and advice on making this a more practical and worthwhile exercise for teachers.